The fortnight after Marlow Regatta was a very busy one on the river, and preparations for Henley were in full swing on the famous reach. The piles and booms on the rowing course were put in order, and fresh crews appeared daily. Stands, marquees, and entertainment tents appeared and transformed the peaceful green banks into scenes of bustling activity. The graceful white swans were collected and moved to other parts of the river until the time when quiet should be again restored. When the entry lists closed it was found that a record had been established. A week before the Regatta was due to commence, riverside habitues knew enough about the form of the competing crews to give the lie to the sceptics who had foretold a dull regatta, with poor entries, poorer rowing, and lack of interest. Instead of having the racing on only three days, as originally intended, the Regatta Committee was compelled to extend it to a fourth day owing to the numerous entries. Fine weather was all that was needed to make the Regatta a record in every way. With characteristic perversity, the clerk of the weather, who had supplied glorious sunshine during the whole of June, turned on the taps on the opening day of Henley, and forgot to turn them off during the whole Regatta. The racing was watched by crowds clad in mackintoshes, and the river took on a very drab appearance when the showers came along. The rain kept thousands of people away. After Marlow Regatta, the Selection Committee decided that the two Australian crews should have their try-out over the full Henley course. After the No. 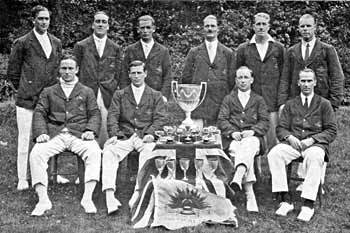 2 Crew's entry for the Fawley Cup had been refused, it was decided to enter two crews for the King's Cup, but it was necessary to make them first and second crews in ability, and not merely in name. The wisdom of having the best men obtainable in one crew is apparent. It was obvious that some alteration in the No. 1 Crew as then constituted would be necessary if they were to be a representative eight. The try-out took place during the week following Marlow. No. 2 Crew proved to be the faster. They had a slight lead at the half-way mark, and drew away to finish a length ahead of No. 1. To prove that this was not a chance beating, another trial took place on the following day. No. 2 Crew again won — this time with a slightly bigger margin. By this time there was little more than a week before the Regatta would open. The Committee met and decided on three alterations in the first crew — certainly a drastic action. The critics stared open-mouthed when they heard of it ! The new No. 1 Crew went out on the river for its first row and had their time taken. They returned with their faces wreathed in smiles. It was the best row that had been done on the course up to that time. From that day there was continual improvement in the style, and the gain in ability was accompanied by a corresponding increase of confidence, both on the part of the crew and its supporters. The Walton on Thames Regatta was held on June 28th, and because of its closeness to the Henley Carnival, did not attract so many Henley crews as Marlow did. The Australian No.2 entered for the Senior Eights, and A. S. Cox entered for the Sculls. Thames Rowing Club was the only other entrant for the Senior Eights, and the A. I. F. No. 2 Crew beat them over the course — about a mile — by a bare length after a close race. Cox was decisively beaten by Hadfield (N.Z.) in the final of the Sculls. After this, all attention was directed towards Henley.